Jazmine Franklin teamed with McKenzie Bailey to form “Salt ‘n Pepa,” maybe the most underrated doubles team of the last 13 years. 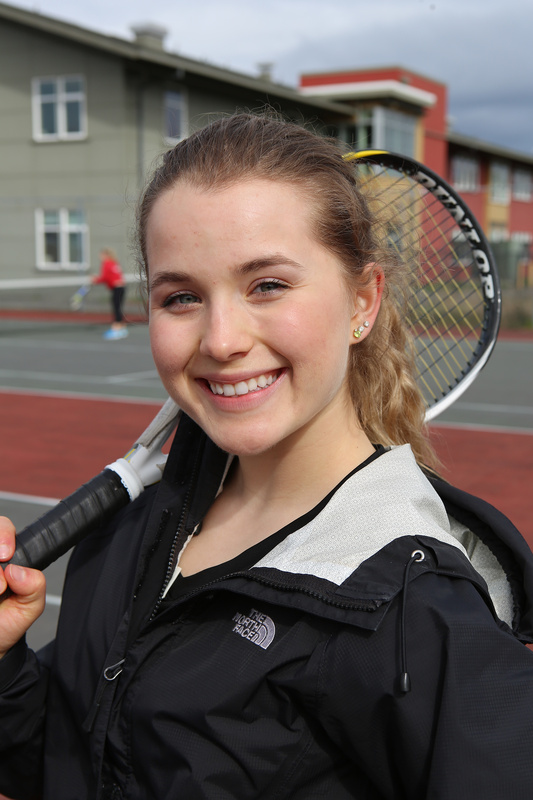 Girls tennis is arguably the most-successful sport in Coupeville High School history. A big part of that run of league titles and postseason glory has come during Ken Stange’s 13 years (and counting) at the helm of the program. The Wolf net guru returns for part 3 of our five-part series on CHS coaches extolling the virtues of the best players they’ve seen. Let’s head out to the court and listen to him reminisce. While the boys’ team has had some success, winning some league titles and even sending some players to state, the boys’ team has always had to compete with football. Football is the big daddy of male high school sports, and I think boys are more likely to grow up dreaming of Friday Night Lights than they are of Center Court at Wimbledon. The girls, on the other hand, have made tennis one of the most successful athletic programs at CHS. Even with the constant onslaught of state track stars and the rise of CHS’s wicked good fastpitch team, tennis has remained strong. We used to routinely have 20+ players; I think we had 28 one year. Although our numbers have dwindled (we had 16 players last year), we ended our four-year run in the 1A Olympic League with four league titles. I’ve had some amazing players on the girls’ team. Picking this list was only easier because I took the liberty of adding two more singles players than I did for the guys. Julia turned 16 a few days before she competed in the state singles tourney, back in 2010. When she showed up in the fall of 2009, I heard rumors of an exchange student who had game. That fall, I saw her hitting with some of the boys while they were getting ready for practice one day. She looked consistent, but she wasn’t hitting the ball hard. I was hoping to see a little more ability, considering she had told me about her club training that she had back home in Spain. Once the spring began, she quietly established herself as the top singles player, narrowly edging out her closest competition. I just kept thinking she had more than what she was showing. I was persistent in asking her about it, and she was usually sheepish about the subject. Eventually, she confided that she didn’t want to showboat for her teammates. She wanted to be liked. That was fine, but I told her that I really wanted her to beat the crap out of her opponents. She did, winning every single regular season match. She won the league tourney. At the Seattle district tourney, she finally lost a match, but not before she qualified for state. She went 1-2 in Yakima, competing well in a very strong field. To this day, her forehand is one of the most ferocious shots I’ve ever seen. We used to bash the ball back and forth, and many times, I watched her humiliate her opponent with her weapon. It’s hard to believe she was just 15 for most of that season. She was smart, kind, well-liked, and a beast of a tennis player. Amanda is the only female to appear on this list twice. I guess if I were to make an all-CHS mixed doubles team, it’d be Aaron Curtin and Amanda. Anyhow, Amanda, Valen and Emily had similar tennis career arcs. All three put together impressive multi-year runs as singles players, and all fell just shy of state, but were playing in incredibly tough districts and would likely have qualified if they played anywhere else in the state. Amanda as a junior and senior was probably the most physically-fit athlete I’ve ever coached. She looked like a professional athlete and even though she wasn’t imposing in size, she looked like the type of person who had been training for a long time. Soccer was her main sport, but she had played tennis as a ninth grader and found huge success as a doubles player. 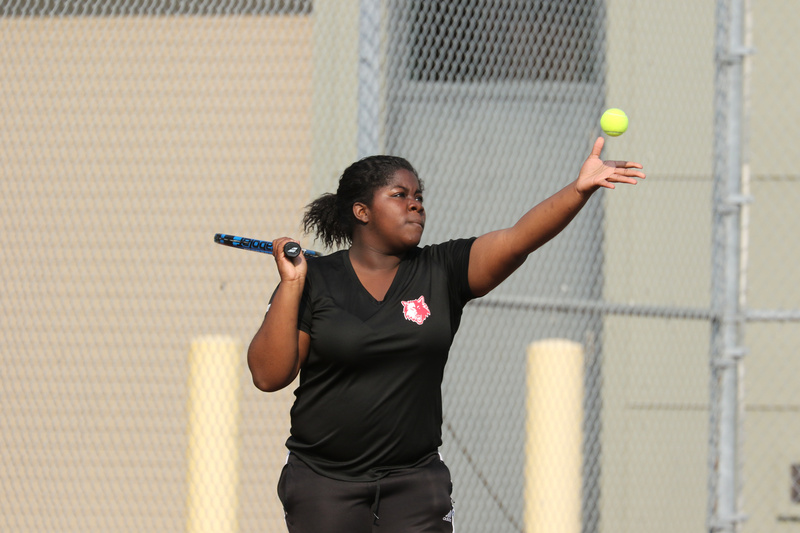 By her junior year, she’d hit the singles court and was making waves. I remember not being able to hit balls that Amanda couldn’t run down and return to me. She was one of the best retrievers I ever coached. What’s more, she constantly worked to improve all aspects of her game. She took her doubles knowledge from earlier, and added the ground strokes that allowed her to hang with the big girls. She ended her career as one of the most solid players during my time at CHS. Valen had everything … but size. Haha. I first met Valen when she was in 7th grade. She wasn’t in my class, but she introduced herself anyway because she was just that polite. I had her in Yearbook class and multiple English classes. I got to know her and her family. When she came out to play as a 9th grader, she had already played a bit, she was very athletic, and we both clicked in a perfect player/coach way. We just got each other. Valen was relentless in her pursuit of good tennis. She kept at it. She was probably 5′ 1″ but she still found a way to have a big serve. She ran every ball down and she never gave up on points. She did it all with unbridled enthusiasm, too. After matches, I often said, “Win (or lose) a match and make a friend,” because she more often than not connected with her opponent. She won gobs of matches, both as a doubles player in ninth grade, and as a singles player for her final three years. She was also most likely to bake goods for her teammates and coach. She was an aggressive soccer player and she translated that aggression to the tennis court nicely. She had pretty good game, too. I was pumped for her senior season because I thought she had an outside shot at qualifying for state in singles. About a week before the beginning of her senior year, a vehicle struck her while she was riding a bicycle in Portland. She had broken her back, and things looked dire. It was originally thought that she may not be able to walk, yet she defied her doctors’ prognosis. King-5 interviewed her and they came out to Coupeville. When she finally got to return to school and I found out she intended to play tennis, despite all the new hardware she was sporting in her skeleton, I was amazed. I tried to imagine the kind of discomfort and pain she was experiencing on a daily basis. Then the season happened. We had to manage her playing because of the accident. She had had a previous surgery on her ankle from a soccer injury. That injury was aggravated by the accident and her ankle would swell up to the size of a cantaloupe every time she played. I remember watching her plant her foot and run during points, and seeing her pain-tightened face as she did it. It was so impressive. She seemed to defy normal human tolerance for pain. She won the league singles title that year and made it to within one match of qualifying for state. Had she not been injured, she would likely have qualified for state. Seriously, they could make a movie about Emily. Allie and Jacki each took their turn at #1 singles and they both were quite dominant, helping their teams secure titles. Allie was long and graceful on the court, so much so that I sometimes accused her of not trying hard enough, but she always said she was giving it her all. Eventually, I was watching her play a match from a different angle. I realized just how fast she was. She looked slow because she made it look too easy. She anticipated and zoom, she was gone! What’s more, she was tall, so she could reach just about everything inside the fence. When Allie left, Jacki assumed the #1 spot. Unlike Allie, Jacki did not make it look easy. Quite the opposite, actually. She was the queen of the three-hour match. Several times, she would be in the first wave of matches and would not finish until the final JV match had ended. Luckily for us, she was usually on the top end of the drawn-out affair. She was a grinder, never afraid to play the long point to outlast her opponent. She was tough as nails to boot, so if she lost a long point, she easily put it in her rear view mirror. Easily the best doubles team I ever coached. They finished 4th in a loaded bracket at state last season, capping a stellar four-year career as the top CHS doubles duo. When I think of who made it look easy, I think of Payton and Sage, and I can only think of them together, much the same as their classmates, Joey (Lippo) and Will (Nelson). They were singular. They just made it look effortless. They were smiling assassins, and they could giggle in the most tense moments. As ninth graders, they said they wanted to play together. I immediately saw state somewhere in their futures, so I committed to putting two of my best into one spot. There were four pairs of incumbent players who planned on beating the young Sage and Payton, and pair by pair, those four duos found themselves somewhere else on the ladder. That first year was difficult. They took their lumps, but picked up experience. They picked up the wins as sophomores and juniors, and came close to making it to state. Their senior year was a thing of magic. They lost a few key regular season matches to teams that went on to qualify for A or AA state. With each of those losses came an increased focus in subsequent matches. They also had a helper named Tezra who trained with them after practice. That work paid off with a 4th place finish at state. Not many players get to finish their careers with a win. Sage and Payton did just that. What made their final season even better was how they took control of the captains’ reins, leading their team to a fourth-straight league title. Their impact will be lasting. I’ll also never forget how Payton ended the district semifinal match by hitting her opponent in the face with a wicked ground stroke. Amanda and Jessica were doubles partners for their ninth and tenth grade years, before Jessica moved to Anacortes to finish her final two years of high school. Although new to tennis as ninth graders, Amanda and Jessica were both ridiculously athletic. Both went on to play college soccer and volleyball, respectively. They picked up the game very fast. I tucked them away at the bottom varsity doubles spot for the entire season while they learned the game and grew more confident. We had two doubles spots available in the league tourney that year, so I let them challenge their teammates for the second spot and they won. At league, they beat their other teammates to win the title, before bowing out at district. As sophomores, they stormed through the league, advancing to districts. They fell one match shy of state, but their performance was memorable. Unfortunately, their time as partners ended, but it was a great run nonetheless. When I took over the CHS tennis program, the entire varsity team had graduated. Hannah and Megan led a strong group of ninth graders that came out for my first season. They made girls’ tennis important and meaningful. They legitimized the sport. Because of them, I enjoyed several years of 20+ players, many of whom were serious about learning and winning. Another soccer/volleyball duo, Hannah and Megan grew to love tennis. It worked out for them because they qualified for state during their junior year – the first state qualifiers I coached at CHS. Their passion to learn, win, and lead their team was admirable, and they set the stage for many years to come after their graduation. McKenzie and Jazmine are the only players on either the boys’ or girls’ list who did not play the majority of their matches in the #1 spot. McKenzie and Jazmine, or Salt ‘n Pepa, as they were known to their teammates, played behind Payton and Sage. Had they played on just about any other team, McKenzie and Jazmine would have been a solid #1 doubles team. They went something like 28-4 over their junior and senior seasons, and served as excellent captains as well. They were about winning and fun, in that order. They lived out loud and I loved it. Av and Tia are the only active players on this list. They are slated to play #1 doubles this year after a strong showing at last year’s district tourney. They are a work in progress, and after next year and the year after, they could be on top of this list, or they could be off this list. The smart money is putting them higher on the list. Av and Tia enter their junior year having had the experience of seeing Payton and Sage’s example as well as having been Payton and Sage’s punching bag. Av and Tia have grown. If they continue to grow, and I think they will, they could make a run at a state medal very soon. Time will tell. Tia is as steady as they come, both in her game and in her attitude. She is a calm ship captain. Avalon wears her heart on her sleeve, and I can most certainly identify with that. She has one of the highest levels of want that I’ve ever seen. The future is bright for Av and Tia, and I’m fortunate to be a part of it. Many competed, and three rose to the top. Coupeville High School coaches honored a trio Tuesday night, naming juniors Hunter Smith and Katrina McGranahan and senior Valen Trujillo as CHS Athlete of the Year winners. It’s the first time any of them have received the school’s highest athletic honor. All three will see their photos go up in the hallway of the CHS gym, joining previous winners such as Corey Cross, Sherry (Bonacci) Roberts, Brad Sherman and Makana Stone. McGranahan — She started and ended the year as an MVP. In the fall, she teamed with Trujillo to lead the CHS volleyball squad to its first league title since 2002. The Wolves went 8-1 in Olympic League play and made a run at the program single-season record for wins (13), finishing 11-6 after two down-to-the-wire losses at districts. Among the state leaders in kills and service aces, McGranahan was tabbed as league MVP, then took the winter “off” to get ready for her #1 sport, softball. The spring was the season of the Kat, as she used her electric pitching arm and ferocious bat to lead the Wolves to a 19-5 record (second-best in program history) and within an out of advancing to state. Throwing every pitch at districts, she hurled 33 innings in less than 26 hours as Coupeville split four games, two of which went to extra innings. 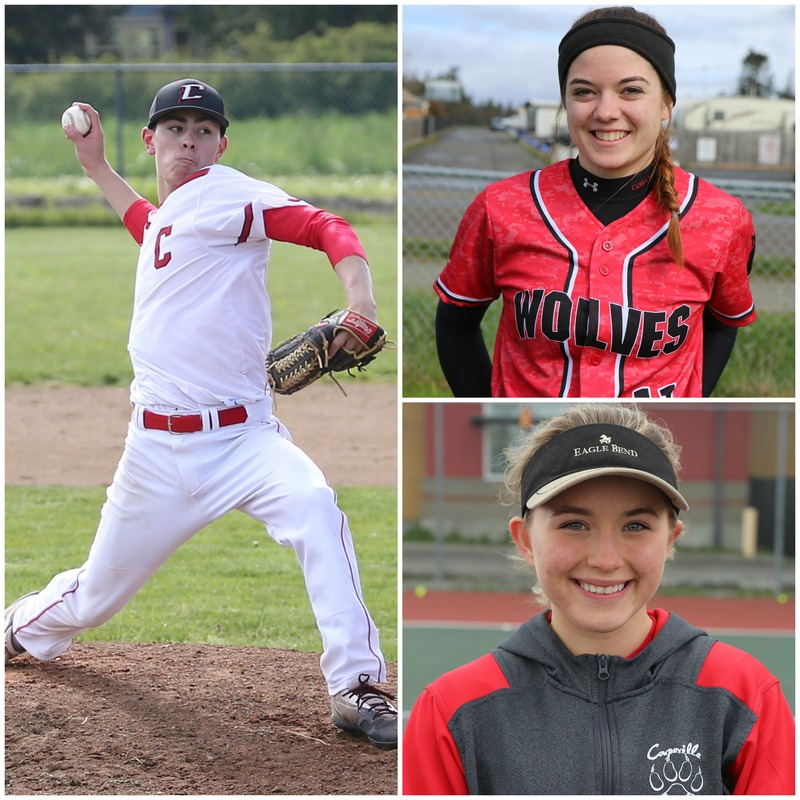 McGranahan, who led the Wolves in almost every offensive category and went 18-5 in the pitcher’s circle, shared Olympic League MVP honors with Shanya Nisbet of Chimacum. Smith — A First-Team All-Conference pick in all three of his sports (football, basketball, baseball), with football coaches honoring him on both sides of the ball. He opened the year by setting new CHS single-season records for receiving yards (916) and touchdowns (11) and sits on the threshold of owning Coupeville’s career records in both those categories, as well as interceptions. As a defensive back who teams rarely dared to test, he recorded 49 tackles and three picks. During the winter, Smith led the Wolf boys basketball team in scoring, dropping 332 points in 20 games, including 29 in a playoff loss to Bellevue Christian. When the spring came, he worked both as a pitcher and infielder, while holding down lead-off duty in the lineup for a CHS squad which finished second in league play behind Klahowya. In a quirky side note, Smith beat the odds, twice named a WIAA Athlete of the Week winner, despite the award’s rules stating an athlete can only receive it once a school year. Trujillo — The anchor to two league-title winning teams, as she helped pace the volleyball and girls tennis teams to triumphant seasons. On the court, she exits as the school record holder for digs in a game, season and career. A three-year starter, the Wolf libero was a constant tumbling ball of fire, racking up more floor burns than any player in the league. Needless to say, she was a First-Team All-Conference player three years running. 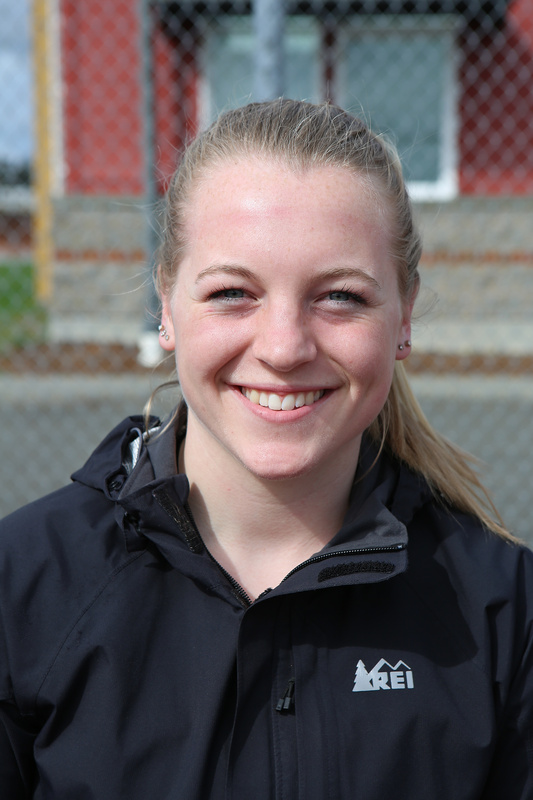 When spring rolled around, she returned to the court for another season as Coupeville’s #1 singles player and went on to win a second-straight individual league title. She followed that up by placing third at districts, winning the final three matches of her prep career. Led by her play, and her quiet but very effective leadership (Trujillo never left a match until all of her teammates had finished playing), the Wolves won their third consecutive regular season team title, remaining unbeaten in Olympic League action. They fought until the final ace. 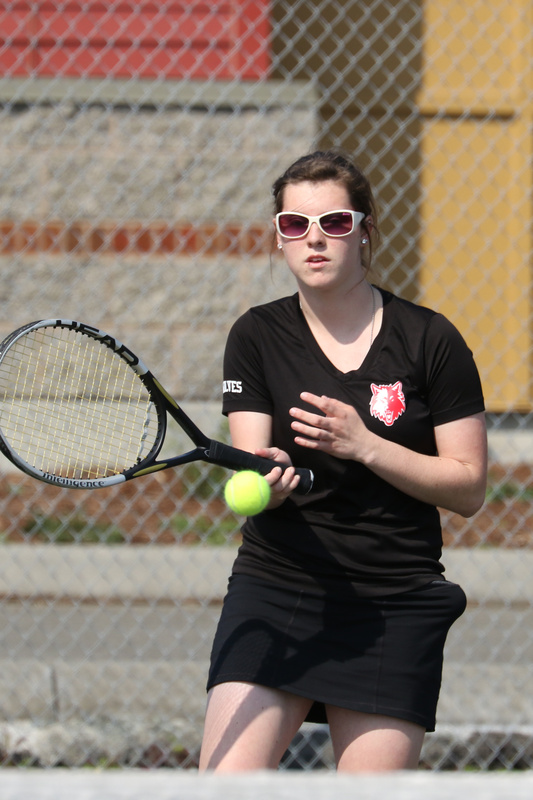 Facing strong private school competition Thursday, Coupeville High School’s tennis players acquitted themselves nicely at the West Central District III tourney at the Sprinker Tennis Center in Tacoma. The Wolves, who matched Vashon Island with a tourney-best six competitors, claimed second place in the team standings. Tourney host Charles Wright Academy, which won both singles and doubles titles, edged Coupeville 23-12 for the team title. Vashon (7), Klahowya (3), Cascade Christian (3) and Chimacum (0) rounded out the field. Wolf juniors Payton Aparicio and Sage Renninger came within a match of punching their ticket to state, falling in the championship match. The first loss of the season for the duo, it shouldn’t overshadow their season. Renninger went 14-1 this year, Aparicio 13-1, and their second-place finish at districts was a serious jump from fifth as sophomores. With District 3 getting only one slot to state in both singles and doubles, they are the alternates to state if something should befall the champs between now and next weekend. Senior Valen Trujillo capped her stellar four-year run with the Wolves with a second-straight third-place finish in singles, winning the final three matches of her career. The trio was joined at districts by foreign exchange student Fanny Deprelle and freshman phenoms Zoe Trujillo and Avalon Renninger. They dominated the regular season, they dominated the postseason tournament. Even with the schedule changing almost at the last second, with the tourney moving up a day and the start time shifting like sand at high tide, the Coupeville High School netters never blinked. 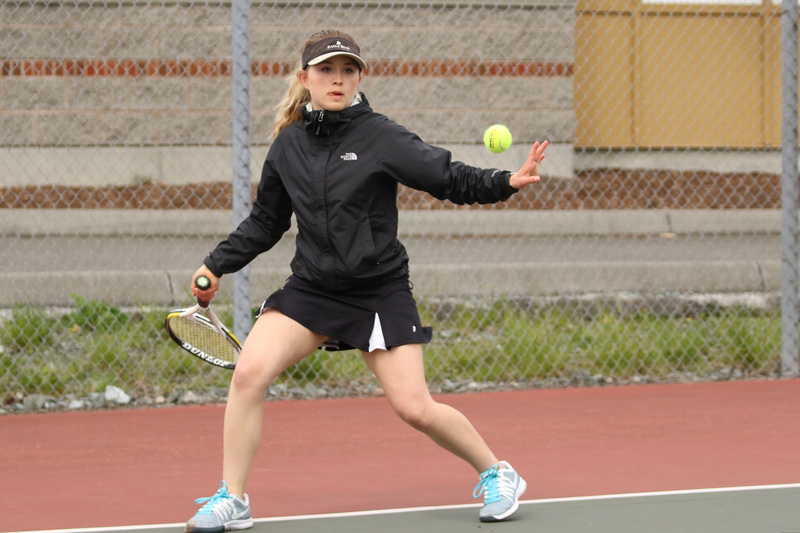 Holding serve, the Wolves swept both the singles and doubles crowns at Wednesday’s Olympic League Tournament in Chimacum and will send six girls to districts. That event, with the top four from the Olympic League meeting the top four of the Nisqually League, goes down May 18 at the Sprinker Tennis Complex in Tacoma. Making the next jump will be a hard one, though, as District 3 only gets one entry to state in odd numbered years. Come back in 2018, and even-year rules will apply, kicking on two entries in both singles and doubles. 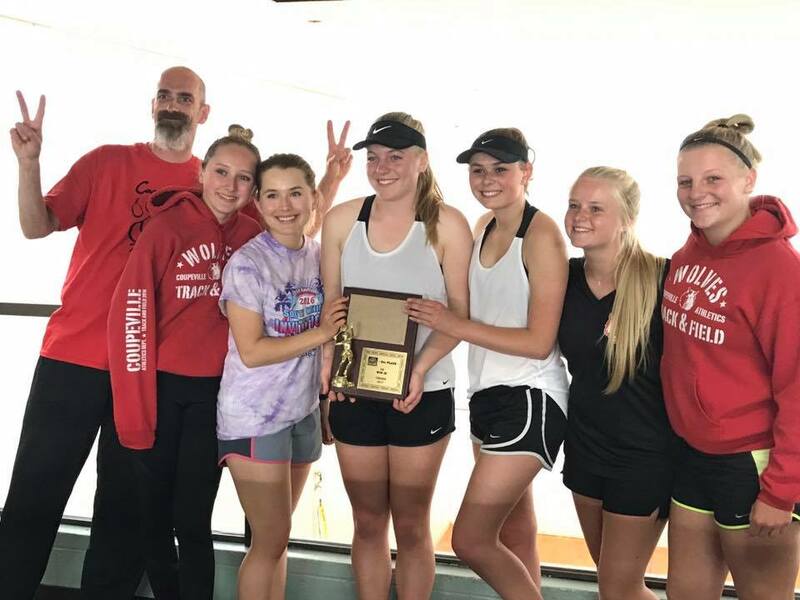 To punch their ticket to Eastern Washington, and the sun-baked courts of the state tourney, a Wolf singles player or doubles duo will have to win three straight matches without a loss to claim a district title. Lose in the championship match and you’re the alternate (and start asking the winner repeatedly if they’re sure they’re feeling alright, cause they kind of sound bronchial every time they talk, and you’re just really, really concerned…). Fall before that third match and you’ll play on in the loser brackets of the double-elimination district tourney, but with no hope of getting a sniff of state. Unless that bronchial infection really spreads. Wednesday, it was déjà vu for the Wolves, as senior singles ace Valen Trujillo and doubles duo Payton Aparicio and Sage Renninger repeated as league champs. The junior combo are undefeated this season, sitting at 11-0 headed into districts. Renninger is 12-0, having won a regular-season match with lil’ sis Avalon when Aparicio was out of town. Districts will be a family affair, as freshman Zoe Trujillo and Avalon Renninger and foreign exchange student Fanny Deprelle round out the Wolf contingent advancing. Chimacum advances one doubles team — Gladys Hitt and Christine Bell — after the duo claimed third. Valen Trujillo avenged an earlier loss to Klahowya’s Sydney Jackson, beating her twice. Clear some space on the Wall of Fame. Rolling to two wins Thursday, the Coupeville High School girls tennis team clinched its third straight 1A Olympic League title. Scrambling to catch up from the ravages of a rain-soaked spring, the Wolves wrapped up a suspended match first, then strolled to another victory in their regularly-scheduled rumble. Both wins came by identical 5-2 scores over host Klahowya. With the two-for-one deal, Coupeville stretched its winning streak to six matches and sits 4-0 in league play, 6-3 overall. The Wolves have never lost a conference tilt in the three-year history of the Olympic League, and their streak sits at 15 straight. That’s the fourth-best run behind Coupeville girls basketball (27-0), Klahowya girls soccer (20-0) and Klahowya boys soccer (19-0). Thursday’s action picked up where things left off Apr. 18 in Coupeville. With the Wolves up 2-0 and four matches in action on court, rain unleashed and refused to stop. Given better weather Thursday, the two squads wrapped up things, then skipped the normal two-out-of-three sets format and played pro sets in match #2. First doubles duo Payton Aparicio and Sage Renninger added two more wins to their ledger, running their season record as a duo to 8-0. Renninger is 9-0, having won a match with sister Avalon when Aparicio was out of town.